When you take into account his past campaigns, it’s no surprise that Craig Green would once again turn to sculptures and his recognisable set designs for AW18. As with his AW17 campaign, the London-based designer enlisted still life photographer Dan Tobin Smith to shoot a huge water-raft made of people wearing his collection (styled by Dazed creative director Robbie Spencer with a set design by David Curtis-Ring). 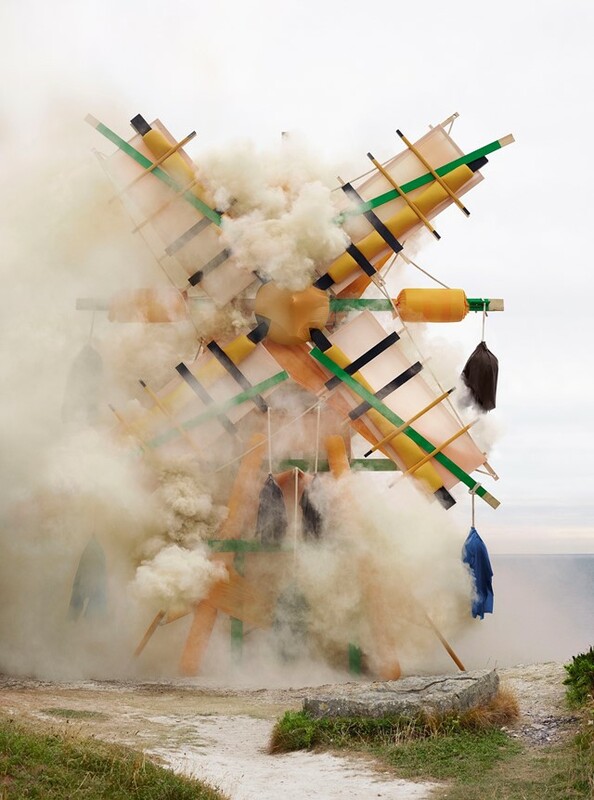 For the following season, Green commissioned the same team to set on fire giant recreations of the SS18 show’s sculptures. Now, Craig Green collaborates with Spencer, Smith, and Curtis-Ring to bring life to his most recent collection. This time around, the campaign images feature 13-metre high windmills, which took a team of 18 people two weeks to make. The structures were photographed in Dorset over the course of four days – which allowed the images to have different backgrounds depending on the time they were shot – first in their clean form, then inundated with smoke, which demonstrates their delicate but perishable nature. Check out Craig Green’s latest campaign in the gallery above, and head here for a closer look at his AW18 collection.